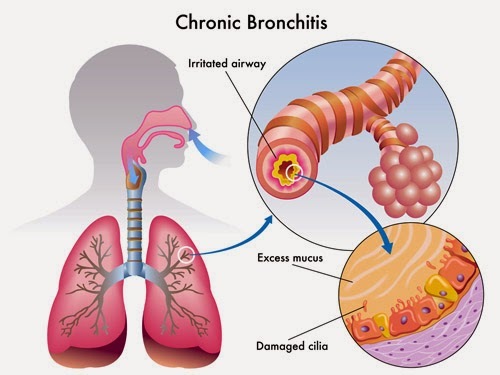 Simple chronic bronchitis is a condition in which there is chronic or recurrent increase in the volume of mucoid bronchial secretion sufficient to cause expectoration. Throat cleaners who swallow their sputum should also be included in this definition, but it is not possible to diagnose chronic bronchitis with confidence in the presence of other cardio-pulmonary disease which may themselves give rise to expectoration. Chronic bronchitis may be complicated by infection, giving rise to chronic or recurrent muco-purulent bronchitis in which the sputum is persistently muco-purulent. On the other hand chronic bronchitis must be further complicated by persistent widespread narrowing of the airways at least on expiration which causes airways obstruction. It may then be termed chronic obstructive bronchitis. The following may be causes of this condition. Ø Cigarette smoking: The death-rate among cigarette smokers is generally high. Ø Atmospheric Pollution: Smokes and sulphur dioxide are the major factor in the air pollution. Ø Infection: Infection with respiratory Bacteria’s (Mycoplasma pneumonia) and viruses especially H. influenza causes most of the danger. Ø In occupations, dust and fumes e,g, in coal mines and steel and flax workers, there is greater prevalence of the disease. Ø Chronic bronchitis is more common in men and incidence increases with age. Ø Infection increases air way obstruction and poor ventilation and decrease in blood flow, the condition deteriorates further. ü The onset is extremely insidious; throat clearing and the swallowing may be the only symptoms left on the surface. ü Usually there is expectoration of mucus with cough after waking. ü As age advances, the cough becomes more troublesome. The sputum is at first mucoid, but in many contains black specks of carbon particles from smokes. Later it may become yellow or green. ü Breathlessness may first become apparent very gradually on exertion and then it may be accompanied by wheeze. ü There may be no physical sign but with increasing mucus secretion, rhonchi may be heard which clear on coughing. ü Airway obstruction increase and with it wheezing may become persistent. ü Clubbing of fingers is exceptional and should give rise to suspicious that carcinoma of the lung is present. ü Advanced chronic bronchitis leads to respiratory failure. There may be loud closure of pulmonary valve. ü The liver is enlarged and there is peripheral oedema. It is made by examining the respiratory movements of the chest, there rate and rhythm etc. Asthma is often associated. In long-standing case, bronchiectasis, emphysema, and ultimately congestive heart failure may appear. From frequent coughing, hernia may develop. The condition, though progressive, is not fatal, but the chances of complete recovery are meager with longevity shortened. Is to be made from chronic pulmonary tuberculosis and pronchiectasis. Diagnosis of bronchitis is made by seasonal onset of cough, associated with rhonchi and rales in the lungs and progressive emphysema, while that of pulmonary tuberculosis by the presence of tubercle bacilli in sputum. ¬ The patient should be put to bed. ¬ Dusty, stuffy and damp atmosphere should be avoided. ¬ During the attack, no fats should be used, and fresh luke-warm water be drunk. Aconite: The stage of this medicine is brief. Before the inflammation is localized, it is indicated in the beginning, if caused by exposure to cold draft, or dry cold winds, or if it occurs as a result of checked perspiration, the symptoms being coryza, frequent sneezing, chillness, restless sleep, full hard pulse and anxiety. Antim Tart: This remedy is to be considered at two stages, the early stage and the later stage in capillary pronchitis of children and old people with the following indications: wheezing respiration, Moist rales throughout the chest, cough appears to be loose, but no phlegm is raised, in children there is no cough, but there is drowsiness, superficial, laboured respiration and vomiting of food, and mucus may sometimes be there. Belladonna: violent fever. short, dry, continual distressing cough, worse at night and on lying down, breathing irregular and hurried, no expectoration ; if it is there, it is blood-streaked, fullness in chest without pain, though children cry, when coughing, and skin is hot, and inclined to perspire only with occasional starting. Bryonia: Seldom indicated in pure bronchitis, it should be prescribed when: the cough is very severe, and hurts the head and distant parts of the body,the patient presses the head or the side of the chest, while coughing, great pressure on sternum, dyspnoea and dry cough which seems to start from the stomach, the cough is worse after a meal, and has no expectoration practically, stitching pain in the side of the chest indicate it specially, and aggravation from a change of warm to cold atmosphere. Carbo Veg. For bronchitis of old people having: profuse, yellow, offensive expectoration, Dyspnoea, much rattling in chest, and burning. Mercurius Sol: An excellent remedy in inflammatory bronchitis, when indicated as : dry, concussive, exhausting cough, sputum, watery, saliva-like, or muco-purulent, fever with alternation of chill and heat, desire for cold drinks which aggravate the cough, pasty sweat without relief, and soreness and roughness from fauces down to middle sternum. Phosphorus is adapted to sub-acute, lingering cases of persons who are delicate, tall, slender, overgrown or phthisical, having the following indications: paroxysmal cough with pain below chest, suffocative pressure in the upper part of chest with constriction of larynx. hoarseness, mucus rales, bloody and mucus sputum or purulent, having a salty or sweetish taste; patient better after sleep, respiration is halting with a tendency to pneumonia, cough worse after meal and going to open air, soreness and drowsiness of chest, and use of voice aggravates cough. Sulphur is adapted to chronic cases, when: loud rales are present, profuse, thick, muco-purulent expectoration persist, and suffocation in attacks exists. Ipecacuanha is similar to Antim Tart, but the rales are louder and coarser with much coughing, which does not bring out to sputum. There is no prostration like that of Antim Tart. (Senega, Lachesis, Arsenicum, Nux vom., Rhus Tox, ‘scilla’ Veratrum Album and Dulcamara are valuable remedies for bronchial catarrhs old). Kali Carb is a suitable remedy for capillary bronchitis, when there were sharp stitches in the chest along with dyspnoea, choking cough and great weakness. Heper Sulph is a suitable remedy for loose, choking, rattling cough with moist rales. The expectoration is yellow and voice is hoarse. Pulsatilla is to be given, when the expectoration becomes copious, loose thick and muco-purulent. If hepatic symptoms are present in the capillary bronchitis, Chelidonium is the remedy. Kali Bich: Acute or chronic bronchitis, where the mucus is tough and difficult to raise. Causticum for long-standing cases of emaciation and disease, where burning soreness, rawness are characteristic indications. Alphonia or hoarseness is present. The patient has mucus under the sternum which he cannot raise. Besides, he cannot lie down at night. Carbo Veg for old persons with blue nails, cold extremities, profuse, expectoration without any power or raise it; hoarseness. Lycopodium: Bronchitis complicated with emphysema. The cough sounds loose, but not easy to raise; cough, worse from stretching the arms, stopping and lying down on the left side, from eating, or drinking cold things, in the wind, or in the warm room. Symptomatic Homeopathy medicines help for Asthma. Its good to consult the doctor to get symptomatic treatment.